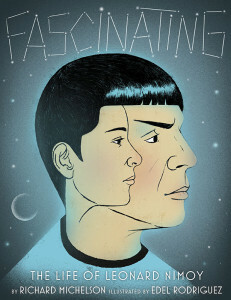 Richard Michelson is the author of the new children's picture book Fascinating: The Life of Leonard Nimoy, a biography of the Star Trek star. Michelson's many other books for children and adults include the work of poetry More Money Than God. He is the owner of R. Michelson Galleries and served as the poet laureate of Northampton, Massachusetts. He lives in Amherst, Massachusetts. Q: You write that you knew Leonard Nimoy well. Why did you decide to write a biography of him for kids? I’d facilitated numerous press interviews [with him] over the years and knew everyone was interested in his life. I’d written many other picture book biographies, and Leonard and I often discussed my works in progress. He even recorded my book Too Young for Yiddish. I did not know Leonard would pass away only three months later. I am glad I didn’t wait! Q: How would you describe Nimoy's feelings about his most famous role, Spock? A: Leonard loved the character of Spock and he often said that if he could choose the one role to be identified with, it would be that of Spock. As I explain in the book, Leonard brought much of his personal history to the role. He parents were Jewish immigrants who escaped pogroms in Ukraine and Leonard often felt like an outsider in his own neighborhood. The famous Vulcan hand gesture also stems from an experience that Leonard had as an 8-year-old boy in temple. There has long been a rumor that Leonard resented the character, but this began with his poorly titled autobiography, I Am Not Spock (which was followed years later by a second biography titled I Am Spock!). Those who actually read the first book, however, understood that Leonard was not rejecting the character, but rather commenting on the odd experience of meeting fans and being introduced to their kids as “Spock,” even when he was not “in costume,” which couldn’t help by confuse the children. But Leonard always appreciated his fans, and the opportunities that Spock gave him to enjoy life and pursue his many interests. 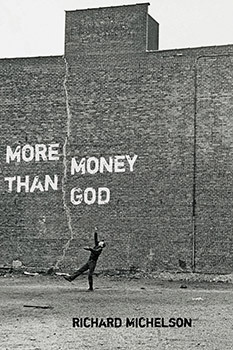 Q: How did you choose the title of your latest poetry collection, More Money Than God (also the title of one of the poems), and what does that title signify for you? A: More Money than God is the title of one of the poems in the book, and I felt that poem encompassed may of the overriding themes in the book—the death of a parent, wrestling with belief, how we deal with grief, and the beauty, solace and hope that art can provide. Plus the title is funny (I hope. It is meant to be), and life without humor is a poor prospect indeed. Q: You write your poetry in different forms. Are there some you particularly prefer? A: I write in both form and free verse—one is not necessarily easier than the other-- sound and rhythm is integral to both. The poem will generally tell you what it needs during the writing of it. But I do tend to work in series—I might write in a loose sonnet form for a few months, and then change direction toward a longer narrative. I will happily use whatever “tools” are available to make the words work! Q: Much of this poetry collection deals with history, especially family history and the legacy of the Holocaust. Why have you chosen that as a topic on which to focus? A: One’s concerns are one’s concerns, and I can only write about the issues that are daily in my consciousness. I am a political being and my view of life was forged early on. When I was born, my neighborhood in East New York, Brooklyn, was 90 percent Jewish and harboring the shadow of the Holocaust. A short 12 years later it was 90 percent African-American, and would soon be majority Latino, sparking my life-long interest in historical, racial and economic issues. A: I have a new children’s book out in Spring 2017 with the illustrator Karla Gudeon called The Language of Angels: A Story about the Reinvention of Hebrew, which is about how one man and his son took a language that hadn’t been in daily use (aside from prayer) for 2,000 years and brought it into the modern world. What an amazing achievement! Children (and adults) will have a new understanding of how words are made, and how meanings evolve. For an adult audience, I am also working on a new book of poetry to follow More Money Than God. A: Well, since it is the question I get asked more than any other, I will say that, no, I am not Leonard Nimoy’s son and yes, I have been told that we look alike.